It’s always exciting to hear about old Kettler products. 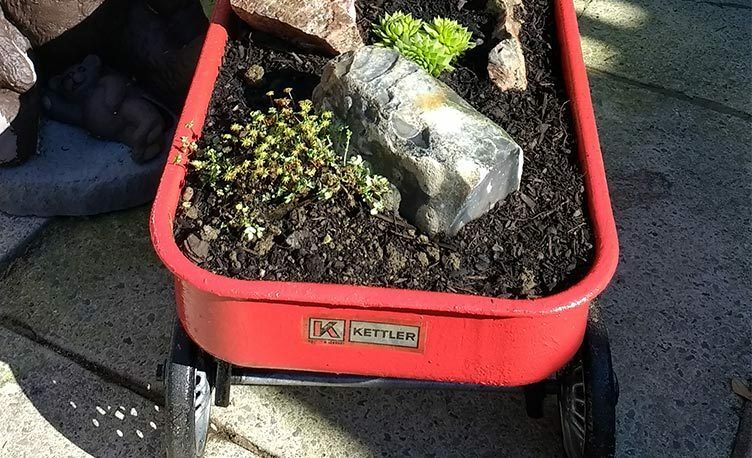 We design our products to last and received a customer’s story about a DIY project with a 50-year-old Kettler truck. As a family, we were stationed at R.A.F. Gutersloh, Germany between 1968 and 1970. Whilst there we bought the truck as a present for our three boys. It was much loved and used by not only our boys but other children as well for many years. Over the bank holiday weekend we were clearing out the garage and came across the truck, very rusty, top of the handle missing but otherwise all intact – even the tyres were still in good condition. Having kept it all these years, I was reluctant to part with it. So we transformed it into a mini-garden and am hoping it will last another 50 years. It shows how well made this truck was to withstand all the fun and games, and neglect over the years. 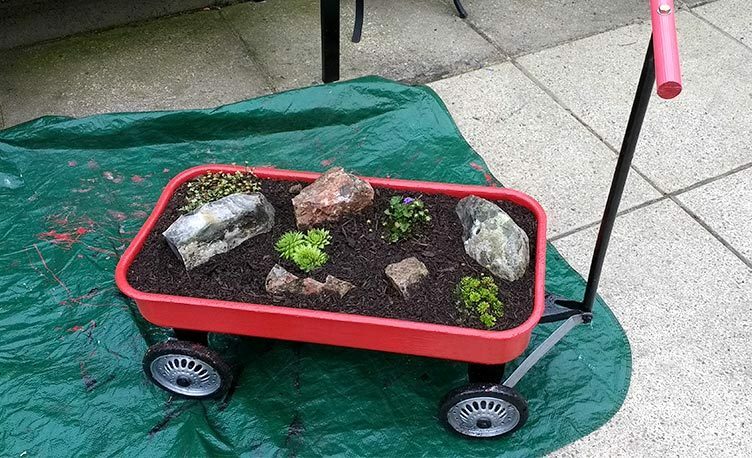 As we sell both garden furniture and outdoors toys, this kind of ingenuity is great to see. Decoration like this would look fantastic in a traditional garden and includes a fun story to tell every new visitor. 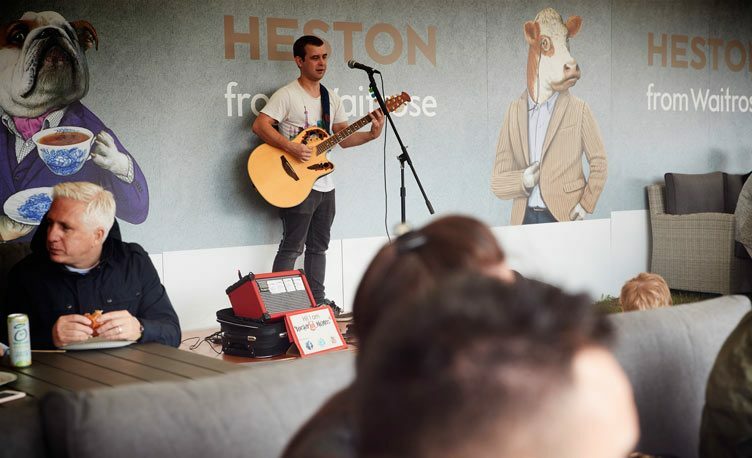 The third week of August saw Kettler and Everdure by Heston Blumenthal on show at the Waitrose Summer Festival. 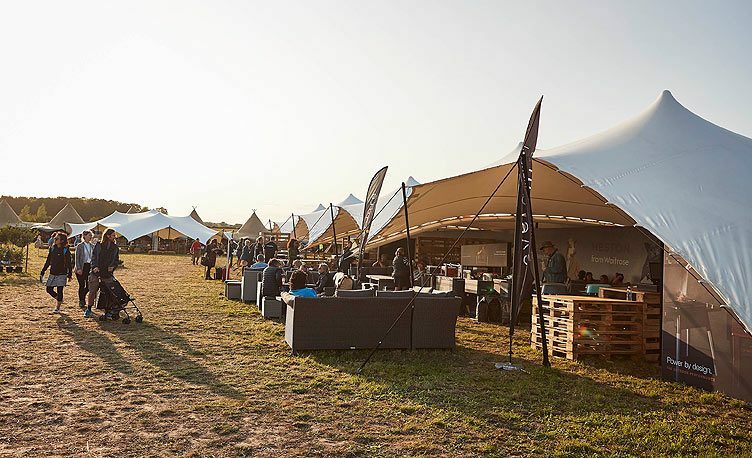 Held at the Leckford Estate, on the sprawling green fields of Hampshire, the 3 day festival included celebrity chefs, food stalls and cooking schools. Heston Blumenthal’s team at the Fat Duck restaurant in Bray cooked up a storm as queues and queues of people waited in anticipation. The menu included the Ultimate Bacon Cheeseburger and the Ultimate Smokey Hot Dog, all cooked on the HUB charcoal BBQ. Festival goers could rest on the Kettler Palma Corner and Palma Mini Corner sofas while beatboxers and soul singers from the streets of Covent Garden serenaded them. Gorgeous cocktails, designed by Heston Blumenthal, were on sale at the bar. Drinks included the wickedly tempting Cherry Bakewell Vodka (available at Waitrose). 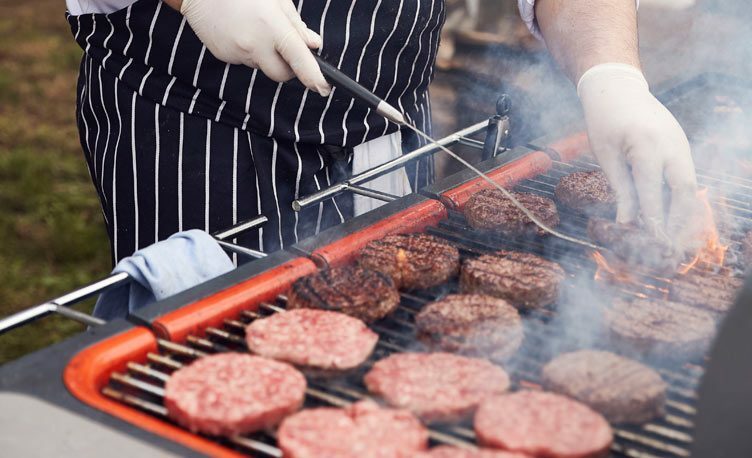 After tucking into their meal, people could then take a closer look at the BBQ’s on display. Staff stood on hand to answer any questions. The full range was on show: from Force and Furnace Gas BBQ’s to the HUB, Fusion and CUBE charcoal BBQ’s. 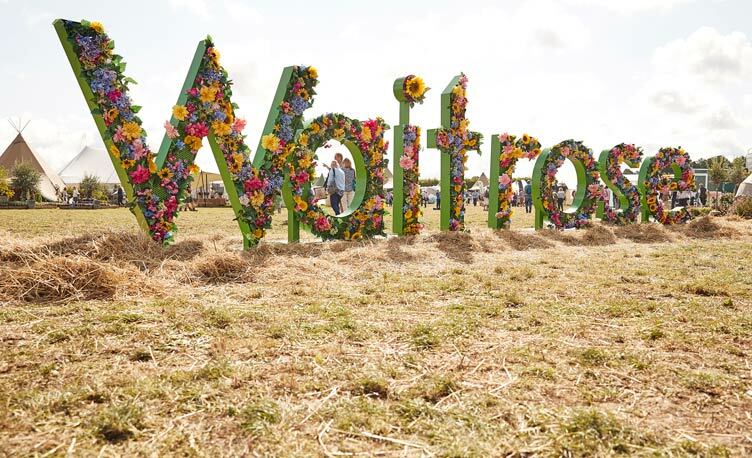 Despite the odd spell of rain and occasional patch of mud, the Waitrose Summer Festival was a success. 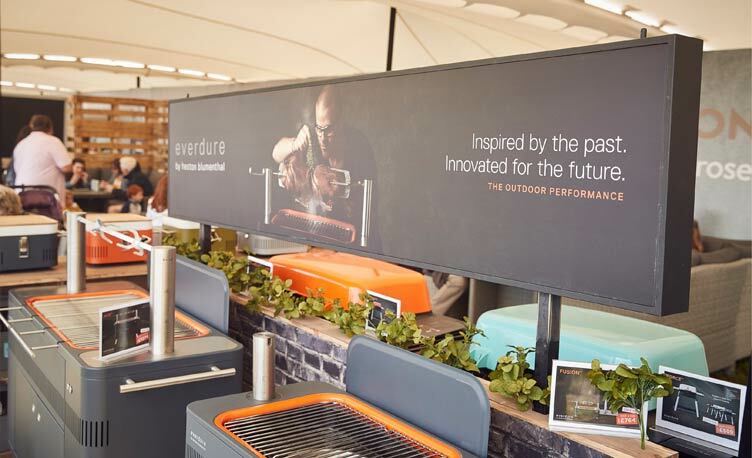 We had so much fun showing off the fantastic Everdure by Heston Blumenthal charcoal and gas barbeques. We are sure that watching the professional chefs at work inspired the many who came to our stand. And yes, the food tasted amazing.